I often get asked for advice on playing guitar with small hands. Many times it’s from women. Because women in general have smaller hands than men, and in general have shorter arms and body build. This advice is equal for men with small hands and even kids. But throughout this article you may hear me talk about the subject with women in mind. If your foot is a size 6, you don’t want to buy a size 9 shoe. That seems like straight forward advice for buying shoes, but it applies to guitars as well. Often I see women trying to play full size standard Dreadnought style acoustic guitars. And really that is fine for some, but others will struggle. Dreadnought guitars are the most common style and size of acoustic guitar. Which is often why people with smaller hands end up with these beasts. But they are far from friendly to people with small hands and arms. One issue with that style of guitar is that the body is too big for people with shorter arms. So reaching your right arm around the body to strum or pick notes is a struggle. As you struggle that also ends up putting the guitar in an awkward position for your left hand as well. So one option for people with smaller hands is to play an electric guitar. Electric guitars have a smaller body making it easy to reach your right arm around to play. They are also easier on the left hand for small fingers. Electric guitar necks are for the most part thinner than acoustics. And the strings are much lighter and easier to press down. There are also electric guitars which have a shorter scale neck. Without going into all of the technical details the most common short scale neck is 24 3/4 inches. A standard scale neck is 25 1/2 inches. When you look at the technical specs on a guitar, those are the numbers to look for under “scale length” if you are looking for a shorter neck. With a shorter scale neck it will be easier to reach when playing chords and notes. Besides the scale of the neck, they come in different shapes and thicknesses. So a short scale guitar can have a fat chunky neck. And a standard scale guitar could have a thin neck. No one person’s hands are the same. So just understand that as you are looking at guitars those options exist. You can also get an acoustic guitar with a smaller body and even shorter scale neck. One smaller acoustic guitar body style is called a “Concert” size. Another is a “Parlor Guitar”. There are also 3/4 size guitars if you have very small hands. Many times acoustic electric guitars with a cutaway body are smaller and easier to handle for small handed guitar players. For more on acoustic guitar body styles, check out this article. In general when you buy a guitar from a music store or online, it’s not “set up” for optimal playing. Beginning guitar players often feel they can’t justify spending the money to set up a guitar. But having your guitar set up properly is important when you are first starting out, and well worth the investment. Often having lighter strings helps for people with smaller hands. The actual gauge of strings depends on the scale of the guitar. But when telling the guitar luthier or repair person how you would like your guitar set up saying things like…easy to play, light strings, low action…will help get you what you are looking for. A capo is a clamp that you can use on different frets of the guitar to change the pitch of the open strings. So you can change the key of a song without learning new chords. But in this case the reason for using a capo is to make playing your current guitar easier. You might try putting the capo on the 2nd or 3rd fret to start with. Using the capo in this situation is going to do 2 things. 1. Shorten the scale of your guitar temporarily. By using a capo, what was the 2nd or 3rd fret is now your 1st fret as far as you are concerned. Sure it sounds higher in pitch. But now it will be easier to reach and play your chords. 2. The capo will also lower the action of your strings. Even without having your guitar set up like I already talked about. So it will be easier to press the strings down. The reality is that there are some things that you will just not be able to play with small hands. And some things you can do that people with large hands can’t. So there will be some times when you might choose chord substitutions that will be more friendly to your hands. Or leave out notes in a chord. Playing wide stretch chords needed to play some songs from the Police just may not be your thing as a small handed guitar player. Check out one of my favorite female singer songwriters Serena Ryder. She plays a 3/4 size acoustic guitar in this video. So small hands can rock. Side note: The electric guitar player on the left (John Kengla) was a student of mine from the time he was a young kid through high school. He now tours all over the world. Below is a guitar lesson to check out that will help no matter what size your hands are. Guitar Chord Help – Having trouble playing some of your guitar chords? 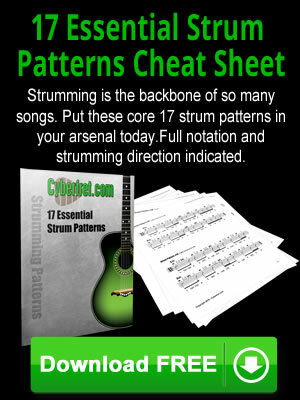 Need a little help with guitar chords? Here are a few chord troubleshooting tips to help out.